The Conference Board of Canada recently released their latest report card on an aspect of Canadian society or its institutions. This time they have focussed on Social performance. I personally like these reports. The Conference Board is by and large a non-partisan group that truly tries to analyze aspects of Canadiana from an arms-length perspective. From a guy who makes a living analyzing stuff (I don’t want to be too specific) and looking at how others analyze stuff, I do take what these folks say seriously. The study is based on the World Values Survey; a project based in Stockholm, Sweden that aims to assess the state of sociocultural, moral, religious and political values of different countries around the world. I find one of the indicators developed from these results to be of special interest: Confidence in Parliament. While it is generally acknowledged that public confidence in government institutions has waned in recent years (to put it mildly), some of the conclusions reached by the Board are particularly thought-provoking. Canadians today have less confidence in parliament than they did in the past. The share of respondents reporting a high level of confidence fell from 42 per cent in 1982 to 38 per cent in 2006. That is not a huge drop, but still should be noted. 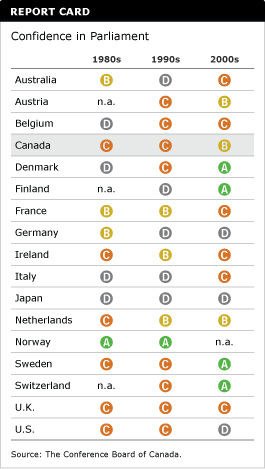 Overall, Canada is given a “C” grade. Kinda like in elementary school when you went home and said, “well, I didn’t do as bad as Mikey – who got an “F”! Not great but not as bad as Mikey. In this case, The U.S. is Mikey (Thanks Dubya!). While Canada’s relative grade improved to a “B” in the current decade, it did so only because recent data are not available for Norway. As much as I would like to blame the Harperites for this seeming lack of confidence in our top national institution, to do so would be wrong. It is not only the fault of the current government but it is really a phenomenon that began with (IMO) the election of Mulroney in 1984 and has worsened through to the current day. People are lacking confidence because government have done little to inspire it. I like to use the “politics of cynicism” to describe the current regime, and I don’t take that back. But nor do I only confine that moniker only to the ReformCons – they have simply perfected it. It is important that Canadians regain this sense of trust in their elected leaders’ ability to make wise decisions. As the report points out, the loss of confidence in a this institution may have more serious ramifications. I have given up on Harper as a source of inspiration as a way to augment our levels of confidence, but please, Mr. Ignatieff or Mr. Layton… please break this pattern and give us something to re-engage us.